Latest Coaching Programme for 2019 now available on the Coaching News page. Fees are now due for the 2019/20 season, please follow this link for the latest information on fees for this season. Family Open Day, Sunday 19 May, more details soon. Follow our Twitter page for the latest updates about the Club. Darnhall Tennis Club is set in the heart of the popular Craigie area of Perth. We are a very inclusive club, set-up and run by the members for the benefit of the community, actively promoting the sport to all ages and all levels of play. Members enjoy regional competitions and friendly matches, a weekly members nights for those that just want a regular game, free play anytime, priority use of the courts and discount on coaching. We have 4 courts in all, 1 of which has been adapted for mini-tennis. Three courts are floodlit, with an all-weather porous bitumen surface. With our LTA professional coaches, Ollie Paisley, Alan Cameron, Douglas Gibson and Joy Cameron, we also offer a comprehensive range of coaching for all ages that is available to everyone. News about Coaching and the coaching programme can be found on the website. Memberships for 2018/19 now due. Follow this link for details. All 3 main courts were refurbished in 2014 and floodlights fitted. Court 4 has been painted but not re-surfaced. The courts are open for members, guests and the public, however please note that priority will always be given to members waiting to play over public pay-and-play. Look for the "join us" page to see how you can become a member and benefit from what is the best value tennis club membership in Perth, with the latest membership fees here. 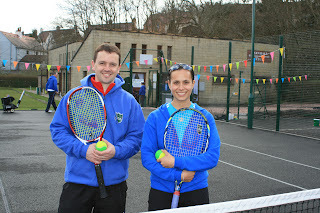 Coaching programmes run throughout the year and we hold fun tournaments and open days at various points. Contact our coaches or see our coaching pages for details of all coaching and keep an eye on the news feeds, Facebook and Twitter for other exciting events. Fee for Pay and Play is £5 per court per hour for adults and £3 for under 18s. An honesty box is located at the clubhouse and all guests are reminded to pay the appropriate court fee before play. Members wishing to bring on guests are reminded that the guest fee is £1.50 per hour. Our courts are generally open from 10:00 to dusk (or 22.00) 7 days a week. Check with our Facebook or Twitter page first for current information. 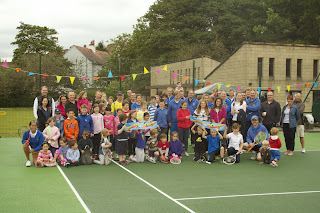 The courts are also utilised for coaching and matches and these will take priority. Check the calendar (here) to see reserved court times. Coaching: Saturday mornings, Monday after school all evening and Wednesday afternoons.